Based on a cost-reduction argument, this study explored whether anticipated childcare support from their mothers influenced adult daughters’ decisions to have their first child. 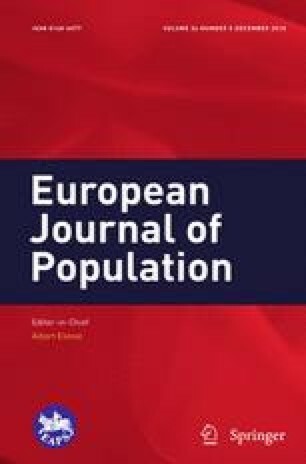 Using six waves of the German Family Panel (pairfam), discrete-time hazard models (N = 3155 women) were estimated for the transition to the decision to have the first child. Anticipated childcare support from the women’s mothers was approximated by the travelling distance between adult daughters and their mothers, a measure whose suitability was tested empirically. The results indicated that women in a position to anticipate having access to childcare support in the future decided to make the transition to parenthood earlier. This finding highlights both the strength of social interaction effects on fertility decision-making and the importance of intergenerational relationships for individual fertility histories already at their very beginning. BIK Aschpurwis + Behrens GmbH. (2015). BIK regionen. http://www.bik-gmbh.de/texte/Beschreibung_BIKRegionen_GS0812.pdf. Brüderl, J., Hajek, K., Herzig, M., Huyer-May, B., Lenke, R., Müller, B., et al. (2015b). pairfam Data Manual—Release 6.0. http://www.pairfam.de/fileadmin/user_upload/redakteur/publis/Dokumentation/Manuals/Data_Manual_pairfam_6.0.pdf. Brüderl, J., Hank, K., Huinink, J., Nauck, B., Neyer, F. J., Walper, S., et al. (2015a). The German Family Panel (pairfam). GESIS Data Archive, Cologne. ZA5678 Data file Version 6.0.0. doi: 10.4232/pairfam.5678.6.0.0.